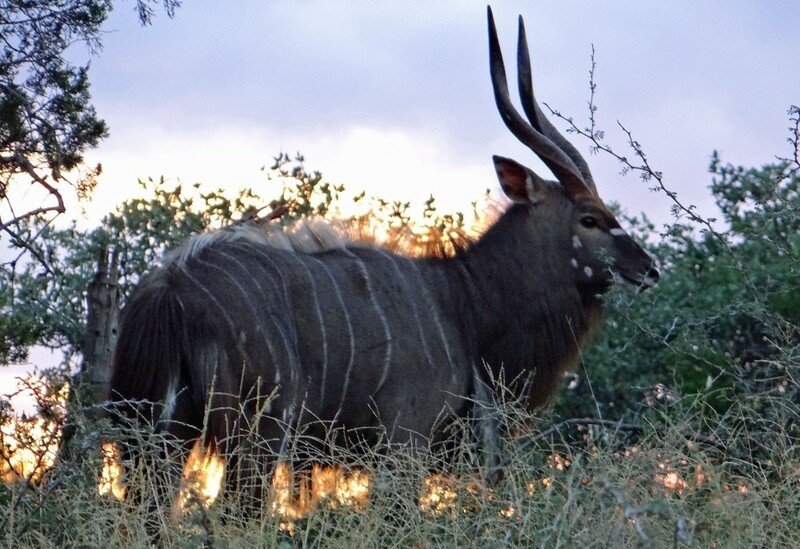 Nyala are native to southern Africa and are one of several spiral horned antelope which include Greater and Lesser Kudu, Bongo, Bushbuck, and Sitatunga. Nyala possess one of the prettiest capes in Africa with mature Trophy Nyala have a grey coat with white stripes along their sides. They also have white markings on their face, a mane along the bottom of their neck, front legs and along their top line with a bushy tail. The lips and lower legs are brownish tan. The female nyala will have the same white markings but will remain reddish color as will the young males. Mature bulls will weigh as much as 300 pounds. The horns are spiraled and will get 24” or longer at maturity. We have a growing herd with about a dozen females. They are very secretive and prefer thick brush coming out to feed very early and late. Females and young males will travel in small groups but mature bulls are loners.